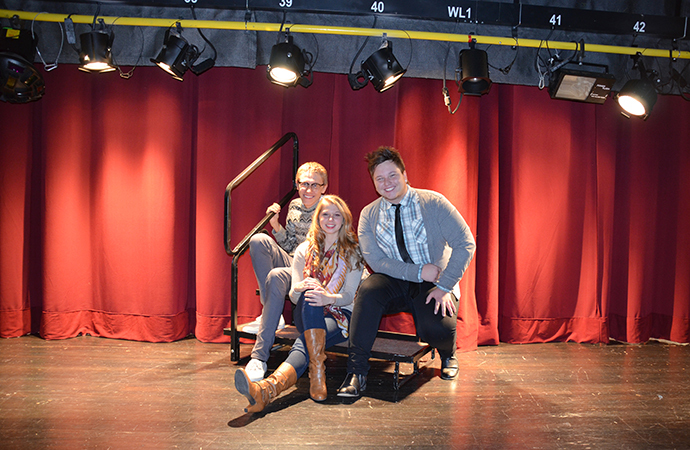 Of the four playwrights featured in last year’s first annual Young Playwrights Project, three remain at Gibson Southern and will again direct their own student-written plays. These students include Christian Rowe, senior, and Jacob Sellers and Alexis Kiesel, juniors. This year, plays were selected after a submission deadline was given for any students who wanted to submit a play to be considered for production. These one-act plays will be somewhat shorter than those featured last year, with approximate running times of twenty minutes in comparison to last year’s thirty to forty minutes. It also works out nicely that each of the three playwrights are in different Theatre Arts classes. This means each class will be focused on the play of the playwright in their class. The plays were also cast from the respective classes. “The Life & Death of Mary & Simon” by Christian Rowe is a highly dramatic account of the Mary & Simon, a mentally-ill preacher and his wife. “The Actuality of Henrik” by Jacob Sellers is an action-packed, quickly-moving play which is sure to entertain and amuse audience members by it’s unique humor and sense of style. “Into the Light” by Alexis Kiesel follows three characters, one of which is already dead, and has an interesting take on time sequencing of events. In comparison to last year, audience members should be ready for some more out-there, unique, and emotional pieces. Young Playwrights Project 2013 is to be held on Saturday, January 19th at 7:00 PM and Sunday, January 20th at 3:00 PM. Tickets are on sale now at www.gshstheatre.com.